Another variety that we bring to our global buyers is Ladies Jeans! Impeccably designed and finished, our Ladies Jeans are high on comfort parameters and are breathable. Furthermore, one can get them in tailored specifications, from us. 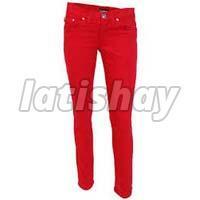 We are renowned Manufacturer, Exporter & Wholesale Supplier of Ladies Jeans from Delhi, India. With our modern transit facilities, we are capable to make safe and swift deliveries.